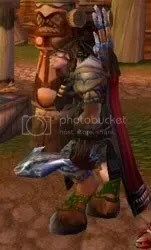 How can I pass up a Blog Azeroth Shared Topic about one of my favorite Professions in the whole World of Warcraft? Especially when it was suggested by the estimable Martha? I don’t have any experience to speak of with fishing IRL, but I enjoy fishing in-game. I find Fishing mindlessly soothing and relaxing. 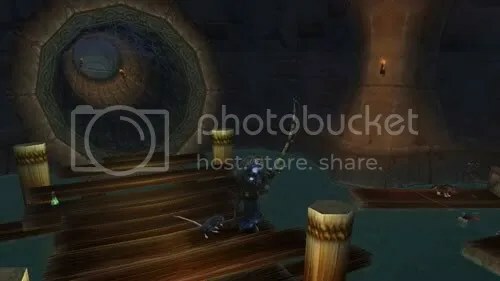 I usually play with the game music and sound effects on, but when I want to fish for a long time — if I’m fishing up mats to donate to the guild bank for Feasts — I turn the game music down and fire up one of my favorite playlists on my iPod. 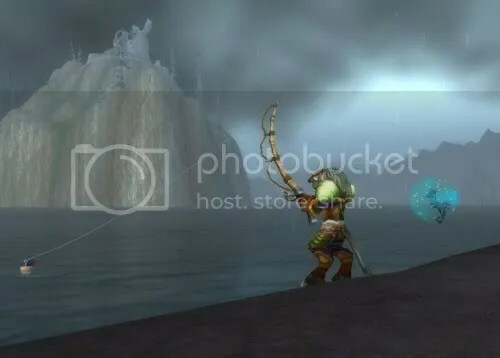 My favorite spot to fish in Cataclysm is off the coast of Uldum, south of the Lost City of the Tol’Vir, almost to the Fatigue line (yay for Shaman Water Walking!). There I can catch the Deepsea Sagefishes I need for my independent food supply, Fathom Eels for the Fish Feasts, and, of course, Murglesnout. The Sea Pony and the Magical Crawdad are her most recent prizes, acquired near the end of the last Darkmoon Faire. She has captured three of the Crocolisks in the City, but never quite got around to catching the fourth one. She’s done the Outland, Dalaran, and Orgrimmar fishing dailies, and I suppose she really ought to do the Thunder Bluff and Undercity ones, too, for completion’s sake. Doing either the Booty Bay or Kalu’ak fishing derbies to get that last achievement for the Salty title, however, has been very low on my priority list — I usually completely forget about them. Mini-Kam has gotten to be very good friends with Kah and Sewa Mistrunner (and also Aska and Naal Mistrunner) over the past few months. Her daily bags of shiny fishing treasures have yielded a Strand Crawler and a Weathered Fishing Hat; I’m still hoping for a Jeweled Fishing Pole. Fishing in the pond on Lower Rise of Thunder Bluff and in Stonebull Lake, her prize catches so far are a 12-pound Mud Snapper (bronze) and a 17-pound Catfish (gray). 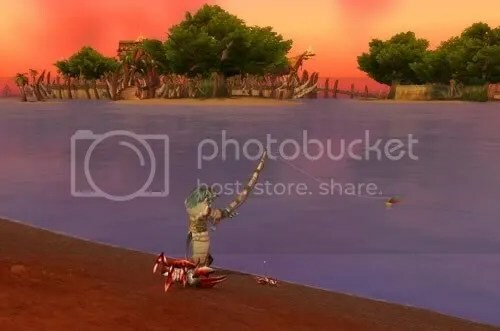 Several of my other characters have just enough Fishing to catch Great Sea Herrings for the Darkmoon Faire. Although I enjoy Fishing as it currently exists, I also often find myself agreeing with those who suggest improvements, such as a personal Fishing Boat or a fishing Net that will allow one to catch many fish at once. The Lure Master Tackle Box introduced in Cataclysm was a wonderful addition. When my Engineer has gotten skilled enough to craft the Tackle Box, I’m sure I’ll make one and send it to mini-Kam, but Kamalia herself has such full bags that she can’t spare the inventory spots for a bag exclusively devoted to Fishing. I’m very much looking forward to finding out what the Anglers faction in Mists will do to make Fishing more fun and interesting. I’m looking forward to fishing in Mists too. I remember asking Coolidge to make me the tackle box as soon as he could but I never got to use it as my bags are always full and I was already using an enchanting or gem bag at the time. 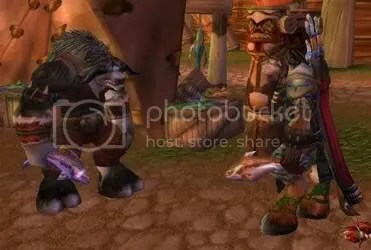 I’m still hoping that they add that baby shark mini-pet which briefly available from Wintergrasp in the Wrath Beta. With or without a bubble would work for me, I might hang in Vashj’ir admiring the scenery more if I had a shark to do it with. 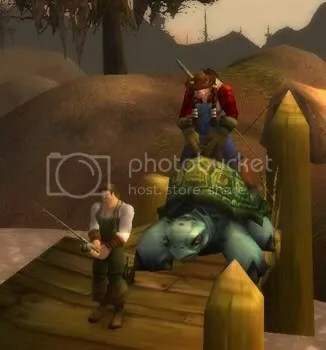 Plus fishing would be the idea source of such a pet, far better than buying it off a vendor. 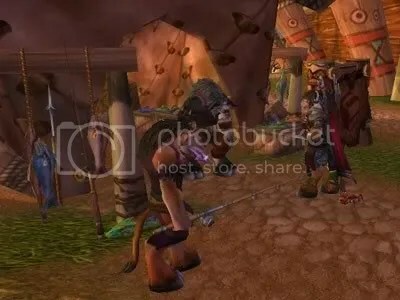 I don’t think I’d ever heard about that pet, but I quite agree — it would be awesome if it actually showed up in the game for real some time. I’m hoping that MoP will add a new twist to the sport, even if it’s not a vast improvement just something to make it a little more interesting would be greatly appreciated. 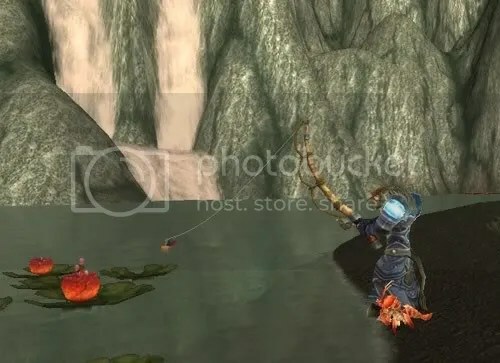 After reading these fishing posts I’ll have to tell my Undead how lucky she is that she got the Jeweled Fishing Pole. Maybe it will spur her on to greater effort at maxing fishing. The coast of Uldum is my favorite spot too. 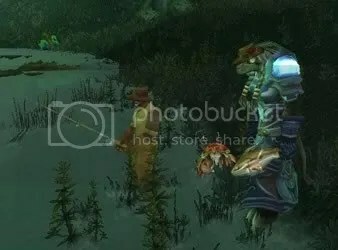 Even had a camel figurine spawn there while fishing!